You’ve heard about letting the data speak for itself. Sometimes, the fastest way to have your data respond is to ask a question using natural language. Natural language queries, or Q&A, is a powerful feature in Power BI. 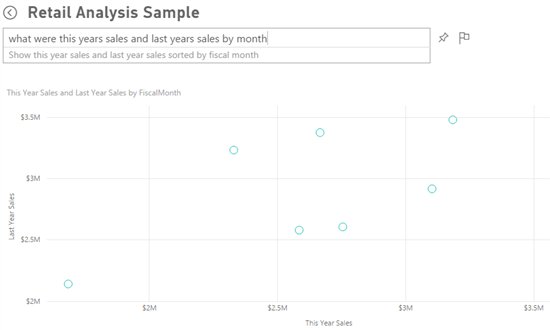 Let’s look at how you can put Q&A to use right away in your Power BI dashboards and reports. 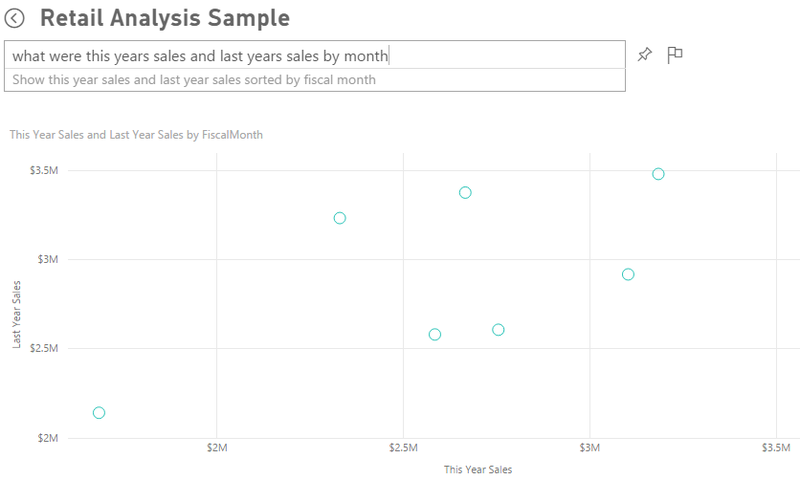 Using the Power BI Retail Analysis Sample dashboard, locate the Q&A box just below the dashboard title. It prompts you to ask a question about the data. First, click in the Q&A box. Power BI suggests questions you could ask about this data. Suppose you wanted to know the totals for this year’s sales. Simply type “What were this year’s sales.” As you type, Q&A interprets the question and displays the answer as a number card. Now modify your question. To your original text, add “and last year’s sales.” Q&A reinterprets your question and shows a table that compares this year’s and last year’s sales. Suppose you want to see the annual sales by month. Continue typing to further modify your question. 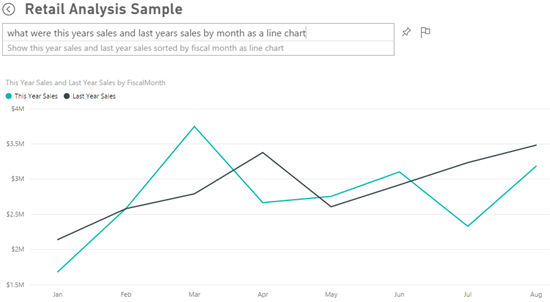 Add “by month.” Power BI interprets the new question and displays a scatter chart comparing last year’s and this year’s sales by month. Don’t like this chart? Modify your question further to specify the type of visualization you prefer. Add “as a line chart” to your query text. Power BI displays the data as a line chart. Now that you have a visualization for your data, you can fine tune it: change the color of the lines, add labels to the axes, or even choose another visualization type. It’s that easy. So how smart is Q&A? Can it answer any question about your data? Q&A searches structured data, such as the data that appear in an Excel table. It has context-dependent keyword search for table, column, and calculated field names. It also has built-in smarts on how to filter, sort, aggregate, group, and display data. For example, suppose you had an Excel table named “Sales”, with columns titled “Product”, “Month”, “Units Sold”, “Gross Sales”, and “Profit”. You could ask questions about any of those entities. You could ask to show sales, total profit by month, sort products by units sold, and others. Q&A can answer questions that are based on how your dataset is organized. How would this work for data in Salesforce? Connect to your salesforce.com account from Power BI. Power BI generates a dashboard automatically. Review the data displayed in the visualizations. Notice the axis labels and values, such as “prospects”, “qualifications”, and “opportunities”. This means you can ask your Salesforce data questions such as: “Which account has the highest opportunity”, “Who generated the most opportunities”, or “Closed sales by month as a bar chart”. Or, begin by looking at the questions that Q&A suggests. If you have website performance data in Google Analytics, you could ask Q&A about time spent on a web page, number of unique page visits, and user engagement rates. Or, if you’re querying demographic data, you might ask questions about age and household income by location. With Q&A, you can not only ask your data to speak for itself, you can tell it how you want it displayed. Try it for yourself. Sign up for free today.